UK: An independent group set up by the UK government to examine plans to set up a Green Investment Bank (GIB) say the project should be launched within the next six months. The commission, which was chaired by former Merrill Lynch Europe chairman Bob Wigley, said the GIB should replace the existing government agencies. It believes the bank could bring in as much as £2bn annually for renewables projects through offering investment bonds. Government agencies recommended for the axe include The Carbon Trust, the Energy and Technologies Institute, Technology Strategy Board, Ofgem Low Carbon Network Fund and International Environmental Transformation Board. Wrigley said these bodies cost around £185million a year. The report believes a £550billion investment in renewables will be required within the next decade if the UK is to meet its emissions targets. However, it says less than 15% of this has been realised due to "market failures and investment barriers". 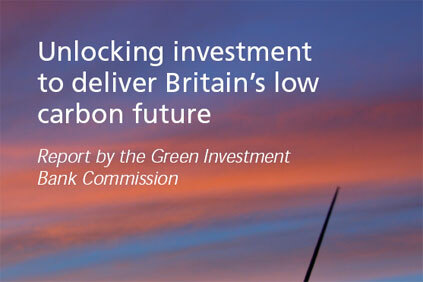 "Low carbon investment is a vital part of our economic recovery and the Green Investment Bank is part of ensuring that UK PLC can lead the world and reap full advantage from the transition to a genuinely competitive low carbon economy. "Detailed proposals on the creation of a UK Green Investment Bank will be brought forward following the Spending Review." The review will be unveiled in October. The GIB formed part of the Conservative Party’s manifesto in the run-up to the May general election. The plans include the launch of bonds to help finance energy projects of up to €200million. The bonds would take the form of tax-exempt savings funds, which would be linked to renewables projects. While the bank itself would be set up along the lines of Germany's government-owned KfW Bankengruppe, which invested an estimated €20billion in environmental projects in 2009. Can the green bank fix UK offshore finance?